After completing my first bushwhack peaks, I thought I was ready for something more difficult: one of the peaks in the "Bushwhack Range:" Lone, rocky, Balsam cap, and Friday. But the weather was getting colder, the days shorter, and I was worried that I did not have the cold weather experience to do the hike safely. 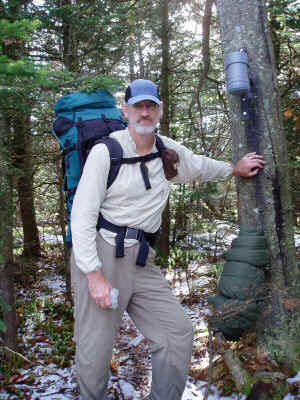 Then Ted Ripley-Duggan posted a brief notice inviting participation in a "moderately paced" overnight trip over nine peaks in the Bushwhack and Burroughs Ranges. I immediately started making plans to go, which included buying some warm clothing. One of the beauties of hiking in California's Sierra Nevada is that although it can get cold at night, it generally warms up to shirtsleeve temperatures during the day. 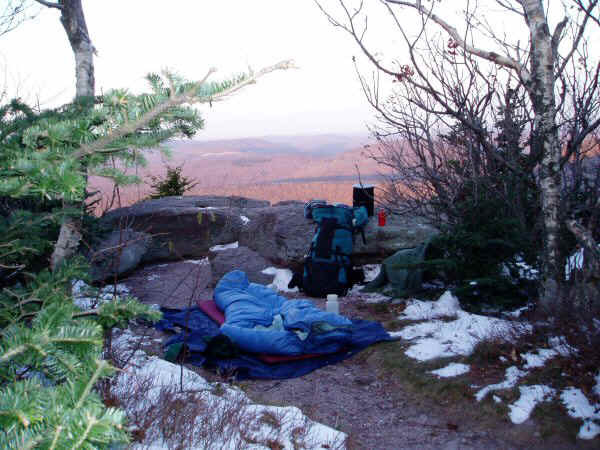 Thus the hiker needs warm sleeping gear, but not a lot of heavy clothing. I was determined to push my limits and find out if I could survive, even enjoy, hiking and camping in the colder Fall weather. Ted was starting Saturday early, but I decided it would be easier to start Friday evening, hike in a few miles, and rendezvous on the trail the next morning. I left the trailhead just before sunset, marveled at the Fall colors and the colorful sunset. The air was cool, and getting colder as I ascended, but I was warm as long as I kept moving. As it got dark I donned my headlamp and kept going. I started seeing patches of snow, until eventually it covered the ground everywhere. I found a marvelous spot to camp, bust below the 3500 foot level at a spectacular overlook. As I got ready to set up my tent I discovered the ground was frozen solid: there was no chance whatsoever that I could get a tent stake in. The wind was blowing so hard that the tent would probably not have stood up even if I had been able to securely stake it. So I just stretched out the bag and slept under the stars (which were spectacular). I don't know what the temperature was, but my water bottles had started to freeze inside my backpack before I stopped for the night. I have never spent the night out in weather this cold, but I was pleased to find that my bag kept me warm and allowed me to sleep soundly through the night. The next morning, I awoke to find all my water frozen, but the wind had abated and the sun was coming out. I had plenty of time before the others came to that out my water and pack up. All that warm clothing came in handy that morning -- I wore all of it and was just barely warm enough. 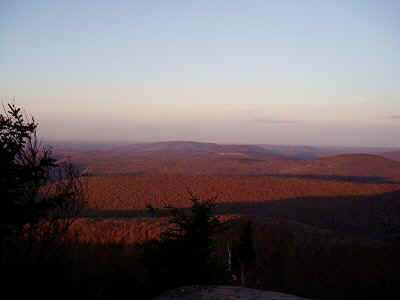 Down below, the trees were showing their fall colors, but up at 3500 feet the leaves were mostly gone. 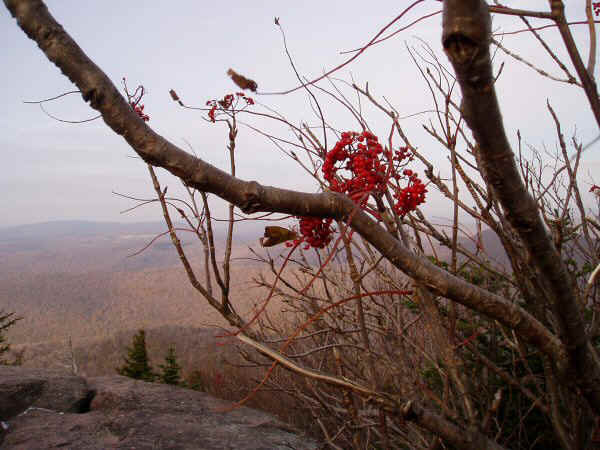 This tree was bare except for bright red berries. . I continued along the trail at leisurely pace, expecting the rest of my party to overtake me. Just below Peekamoose there is a spring, which was still flowing. Since I thought this might be the last water we would come to, I stocked up for the next two days (ten quarts). I reached Peekamoose before the rest of the group, so I sat on the rock that constitutes the peak and enjoyed the sunlight. At about noon Ted arrived, with his companions Adrian, Pat, Joe, and Tim. They were a spirited bunch, full of energy and serious hikers. Their enthusiasm never flagged, nor was there ever any complaining or conflict. In short, good hiking companions. they were all much farther along in their quest to climb the 3500's than I was. 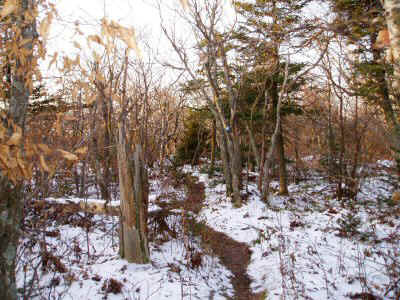 We all continued on to the saddle beyond Peekamoose, left our packs, and quickly made a trip up Table Mountain. then we returned to the saddle, had lunch, and set off on the bushwhack part of the trip. 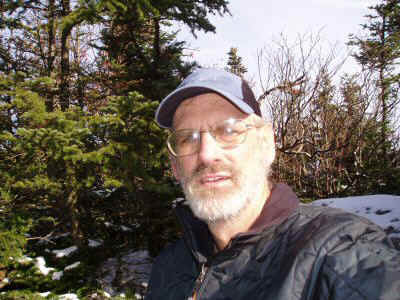 We angled around the mountain to the ridge, then descended through pleasant, open territory to the ridge to Lone. We saw occasional faint signs of a path on the way up the ridge, but the terrain was benign and we could pick our own route. By 4 PM we were on top of Lone, signing the logbook in the first canister of the trip. The crossing between Lone and Rocky is presented new challenges: cliffs, thick brush, and downed trees. I had heard about these obstacles, but up to now had not seen them firsthand. Rather than trying to describe how difficult they made progress, I will just say that we worked very hard for two hours to cover less than a mile between Lone and Rocky. On the way we ran across the first water source since the one on Peekamoose. I still had plenty of water, but the others had not filled up, so they gathered water. I was glad I did not have to, because even after filtering the water was a disconcerting shade of yellow and had a strong taste, according to Pat. By the time we were at rocky, it was getting dark so we elected to camp in the vicinity, just below the 3500 foot limit. 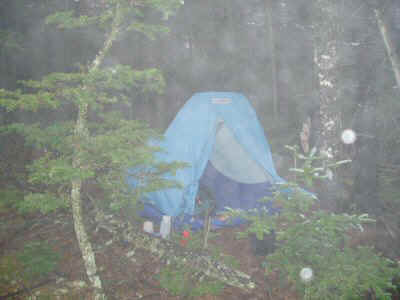 During the night I could hear occasional raindrops falling on the tent, becoming more frequent as morning came. When daylight came, it became apparent that we were in the middle of a thick cloud, and every breath of wind sent water raining down from the trees. The temperature had risen into the high 40s, and I figured I would prefer to get my light clothing wet o I could keep my warmer stuff dry. So I put on my lightest shirt and stuffed everything else in the pack. I was beginning to get worried that we would not have enough time to complete our trip, and had a brief discussion with Ted of the possible alternatives if things went more slowly than expected. I was dismayed to learn that there was no reasonable bail-out, and that we would just have to keep to our original plan. I hoped for the best. 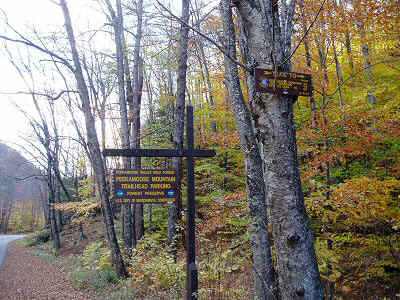 The traverse from rocky to Balsam Cap, also under a mile, again took a full two hours. Again the main obstacle was the thick brush and occasional band of cliffs. The summit area of Balsam Cap is relatively flat, and full of confusing paths leading everywhere, making it challenging to find the canister. When we finally located it, we all quickly signed and moved on before we could get chilled. The route from Balsam Cap to Friday was very interesting. The right side of the ridge is very steep; the left mush less so. I would have picked to travel on the less steep side, but Ted managed to keep us on a faint but distinct path, which kept to the right of the ridge. It seemed to mostly follow a long ledge system. It is very worrisome, with cliffs to the left and right, not knowing if the ledge will peter out. But it doesn't, and even though the brush is just as thick as elsewhere, you can follow where other people have broken through and make reasonable time. It took us only an hour to travel the mile to Friday. The summit area of Friday is guarded on the East by impressive cliffs. We arrived on the ledge in the middle of these, and had to ascent a half dozen or so 30 foot ledges. Each time it looked like we had reached an impassible wall, but we always found some way or other to get up them. I might have lost heart, but Ted never lost confidence that we would make it up somehow. We had a very brief lunch on the run at the summit of Friday, and then pushed on. Ted had been warning us all along that the brush on the far side of Friday was worse tan anything we had yet seen. We had allocated three hours to go the remaining mile to the Cornell-Slide trail. We plunged into the thickets, which were indeed as thick as anything we had seen elsewhere, but not markedly worse. The plan was to head directly downhill (instead of directly towards the trail) to get into more open forest. 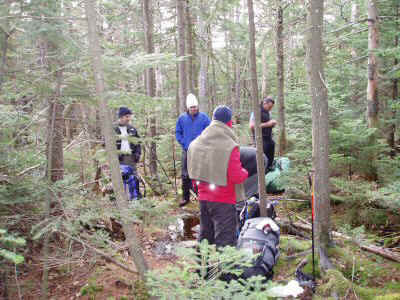 We descended to this point, and were still in thick brush, so we descended even more. Still no relief. Finally we gave up, and turned toward the trail and just forced our way through. We took turns leading: breaking trail was significantly harder than following. This was both because the the leader often had to backtrack from an impassible section, but also because the leader snapped branches off almost every tree along the way, clearing a path for the rest to follow. The forest gradually became less dense, the land less steep. We managed to stay more or less on a ledge system that allowed us to maintain a constant altitude without having to always walk sideways. We unexpectedly came across a delightful stream with flowing water. We could not stop and enjoy the beauty of this area, for we were all becoming concerned with the growing time problem. We pushed on and on relentlessly, until we finally hit the Cornell-Slide trail. That trail, which had looked so skimpy the first time I had been on it, now looked like a highway. We all changed into try clothing, now that we would not be constantly be soaked from contact with wet brush, then hurried along. We were still in a thick cloud, with minimal visibility, so the spectacular viewpoints on Cornell and Wittenberg were a complete bust. I just wanted to get back before dark. When we came to the big cliff below Wittenberg, we stopped to help another party lower two Rottwielers down. We sped down the mountain as fast as we could, making great time. But alas, darkness fell with two miles left to go. We all broke out the headlamps, but even so progress slowed to a crawl. The trail is hard to follow even in daylight, and at night, with a fresh covering of autumn leaves hiding everything, it took all our attention to avoid getting irretrievably lost. We finally reached the trailhead at 8:30, exactly 12 hours after setting out in the morning. I was tired, but not exhausted, relieved to be back at the car but sorry to leave the mountains. For reference, here is a timetable for the hike.